By far Paul McCartney’s most famous post-Beatles album. It is pretty much perfect. No instrumentals, jams or short, lyrically wanting songs, such as on “McCartney”, “Ram” and “Wild Life”. The songs on here are all fully-constructed big, powerful compositions with impact. From the perfect, well-known title track, with its beautiful bass intro slow build up, to the storming (although lyrically nonsensical) single in “Jet” to the full on Beatles-ish rock riff of “Let Me Roll It” - this is an excellent album. 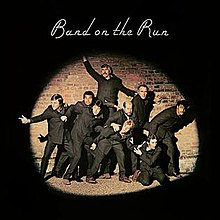 Recorded under trying circumstances in Nigeria, (poor quality studio, a knifepoint robbery and some health problems) the album is played mainly by McCartney, his wife Linda and guitarist Denny Laine, the results are quite remarkable, all things considered. Beatles influences appear for the first time for a while. The closer “Nineteen Hundred And Eighty Five” has a “Lady Madonna” piano riff and an “A Day In The LIfe” mass orchestrated ending, while “No Words” almost sounds like it should be on “Rubber Soul”. It was the most Beatles-ish song McCartney had written since the split. The melodic, catchy “Mamunia”, with its early T.Rex style bongos, the simply beautiful “Bluebird”, the singalong “Ho, Hey Ho” part of of “Mrs Vandebilt” and “Picasso’s Last Words”, with its Beatles-style clarinet instrumentation on its bridge and French background chattering, all add to a piece of work that has not been bettered in the forty-odd years since by McCartney, both commercially and critically. Why, even John Lennon liked it. 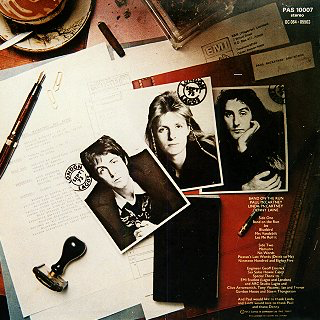 The non-album single, “Helen Wheels” is an enjoyable typical McCartney & Wings rock song. It would have been a bit out of place on the album. “Country Dreamer” is a pedal steel guitar-driven country song, very Beatle-ish too. Standard 70s “B” side fare. Again, no need for it to appear on the album. I bet Ringo loved it.